Add ESRI shapefiles, GeoTIFF (and other images), Kingdom culture (.cul) files, or DUG culture (.duculture) from the project in the Map View. Culture must be imported into the project before it can be used. See Importing Culture Files. Note: An image imported as Culture is treated as culture; it is displayed as a separate culture layer on the map. An image imported as a time slice is treated as an image of a time slice; it is displayed only on that time slice. In the Map View, select the Culture tab. Click the blue “+” icon and click Load Cultures already in the project. Select the culture file(s) to be loaded and click Open. If you are loading an image, see Loading and positioning an image, below. Line settings: Line colour, type and thickness (for vector data). Fill settings: Fill colour and opacity setting. After adding an image to the session, it may require positioning to display correctly. Georeferenced TIFF files usually do not require positioning. 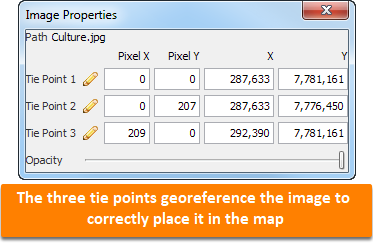 Other image formats (including georeferenced jpg, png, and other images) require manually entering coordinates to position the image. If the tie points are known, e.g. from corner coordinates, enter the corresponding values in the fields. Click Tie Point 1 pencil, and click a known point on the image (e.g. a well, where two axes intersect, or a marked location). Make a note of the X/Y of the known point. Repeat steps 1 and 2 for the second and third tie points. The three points must not lie in a straight line. In the X and Y columns, enter the known points for the three locations. Drag the tie points to interactively make small adjustments. Opacity slider changes the image transparency level. Moving the slider to the left makes the object transparent and right opaque. Note: Images imported as culture are displayed in the Map View. To import images that are displayed in section views (e.g. 2D seismic images), see Importing Image on Views. 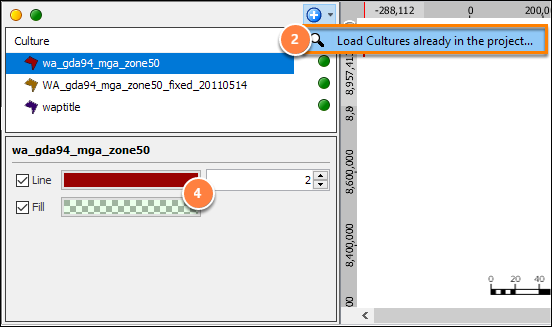 To export culture polygons to DUG’s culture file format (.duculture). 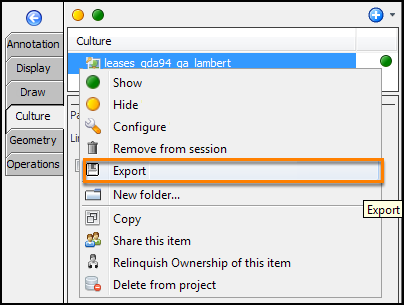 In the Culture tab, right click the culture file and select Export. Type a filename for the culture file. Use the default location for culture ("191culture") or choose a desired path.